What does your institution say about its animal research? There was a time when institutions conducting animal research would deny that they did so (some still do!). Thankfully most research institutions have started down the path of openness. The first step, for many of these institutions, is to put a statement on their website explaining why animal research is necessary. As an institution moves towards greater transparency they may include case studies, statistics about their animal use, and information about their animal welfare. Speaking of Research is compiling a list of statements from institutions about their animal research. We have picked either their public-facing statement, or, where appropriate, their public-facing animal research information page. If university’s do not stand up and explain why they conduct animal research, then why should anyone else support this work? Scientists want to know their institution values their research – a public statement of support is the first step towards that goal. Please check if your institution is included by searching (Ctrl+F) the list, which is ordered by country. If not, have we simply missed the page – in which case send us the link. Or does it not have one, in which case we recommend emailing the appropriate senior administrators and encourage them to write one. Oxford University was once a primary target of animal rights extremists in the UK. In 2005, activists set fire to student-run university boathouses, at an estimated cost of £500,000. More bombs were placed in 2006 and 2007. The University was also the centre of the grassroots pro-research student movement, Pro-Test, which defended the building of a new, improved, animal research facility. If any university had an excuse to try and hide their animal research, it would be them – thankfully, they’re having none of it. The “Animal Research” pages are excellent. explaining why animal research is essential for the world-leading medical and scientific work being done by the institution. 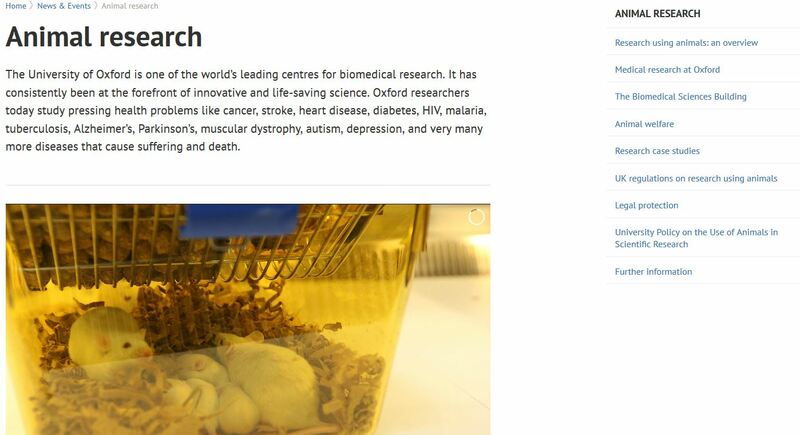 Oxford provide case studies (with videos and pictures) explaining why they use animals for specific pieces of research, they have details of how animal welfare is monitored and improved, they have details of the regulations, and they provide a great overview which includes common questions about research. Around half the diseases in the world have no treatment. Understanding how the body works and how diseases progress, and finding cures, vaccines or treatments, can take many years of painstaking work using a wide range of research techniques. There is overwhelming scientific consensus worldwide that some research using animals is still essential for medical progress. We hope that all institutions become more open about the role of animals in research and why their institution conducts such studies. The more open we are, the better public understanding about animal research is, and the more we show that we have nothing to hide. So check if your institution has a statement on animal research, and if not – ask them why. Posted on November 18, 2014 November 19, 2014 by EditorPosted in News, Outreach NewsTagged animal research, animal research statement, openness, website. Previous Previous post: Let’s show the world what animal research looks like!